China's transition from the 19th century into the 20th century was marked by many of the same trends that were bringing about change in the rest of the world. Politically, the battles for imperial dominance continued and expanded. Economically, industrialization, urbanization and, increasingly, global trade relations brought about the demise of agrarian feudal ties, challenged urban social structures and strained governments. During the late 1800s, China was ruled by the weak imperial Qing dynasty. Their weakness translated into opportunity for European interests eager to add China to their own list of imperial possessions -- if not all of China, then at least portions of it. After Britain's decisive victories in the Opium Wars, China was systematically forced to open treaty ports at its coastal cities. These ports were essentially free trade zones in which foreign nationals and their companies were able to operate with impunity. In this way, sections of China were "ruled" by the British, French, German and Italian businesses that set up shop in particular districts of the country. A number of domestic rebellions and political movements sprang up in the late 1800s to reject this state of affairs and the weakness of the Qing dynasty. Meanwhile, within the dynasty, several high-level Qing administrators attempted reforms to root out corruption and entice the ruling family to be more responsive to the people's desires. The Boxer Rebellion in 1900 was a decisive blow against progressive Chinese interests. Called "Boxers" for their study and utilization of a type of martial arts that used clenched fists, these rebels staged a demonstration by occupying Tiananmen Square. They demanded that the Qing government force the foreigners to leave the country. The demonstration turned violent. Support for the Boxers was so widespread that Qing administrators accepted the assistance of troops from Britain, Germany, France, Russia, Japan and the United States. The result of the uprising was a crushing indemnity of $333 million leveraged by all the foreigners against the Chinese government for reimbursement of losses to foreign business interests, investments and property. Meanwhile, Sun Yat-sen (1866-1925), the son of a poor Cantonese peasant, had been hard at work gathering support for a democracy movement. Numerous secret societies had formed to convene like-minded individuals throughout different levels of society. Their work converged with reform activities within the military which all culminated in a series of small military challenges resulting from the Hankou incident of 1911. Centered in the Hubei province, army officers began to mutiny one after another. Eventually, enough forces stood in opposition to the Qing government to force constitutional reforms and the formation of a national parliament. The Republic of China was established on shaky ground. 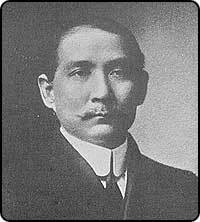 Sun was elected as provisional president, and Yuan Shikai, a retired general, was elected as premier, or prime minister. Soon after, however, Yuan negotiated a special deal with the emperor's family whereby he would guarantee their exile to Manchuria and they would grant him full power to run the country. However, Sun and his colleague Song Jiaoren won both offices in the national election. Then Song was assassinated, and Yuan moved to appoint himself president for five years. He dissolved the National Assembly in 1914 and appeared to be on his way to establishing a dictatorship. Sun escaped the country for a short period, then regrouped in the south of China with the help of numerous allies. 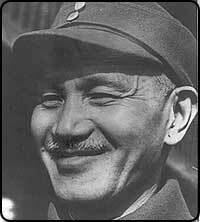 One strong ally was a young soldier named Chiang Kai-shek. Together they set up a military academy, the Huang-pu (or Whampoa) Academy, to train soldiers to form an army. Their graduates would become distinguished military officers in both the Chinese Nationalist Party (Kuomintang, or KMT) army and the Chinese Communist Party (CCP) army. While the KMTs were forming their base in the south, another young visionary, Mao Zedong, was collecting support in the countryside to the north, and in 1921, he and several others founded the CCP. The two parties had very different ideologies and solutions for making China and her people stronger in the world and no longer subject to the dictates of the Europeans and the Japanese. Europe and the United States had recently concluded World War I with negotiations at Versailles in 1919. Delegates from many lands, including China, presented their cases to the Great Powers for their independence and ethnic nationalist homelands. They held high hopes for a positive outcome because of the promise of self-determination that Woodrow Wilson proposed as one of the founding principles of the League of Nations. But the powerful nations -- the European colonial powers -- were not so keen on giving up their holdings. Moreover, Japan had grown into an industrial power, and its aspirations to build an empire on par with European powers had also grown. The Japanese thought it was only natural that they, not the Europeans, dominate in Asia, so they pushed for a "racial equality" clause to be included in the League of Nations charter. Concurrently, China appealed to Wilson and the rest of the Great Powers for its own independence and guarantee of national borders. In the end, because Wilson could not concede the racial equality clause, the Shantung province was granted to the Japanese. This outraged the Chinese because the Shantung province was the birthplace of Confucius and Mencius. The decision resulted in the now-famous May 4 demonstrations of 1919. As Chiang strengthened his armed forces in the south of China, he began to fight the numerous warlords who had emerged to vie for extended influence across the country. Some of these warlords were assisting the Japanese. In 1926, the KMT launched its Northern Expedition to suppress warlord activity and pressure the Japanese to retreat. In 1931, Japan invaded and occupied Manchuria. An agreement was made with the former boy-emperor of the Qing dynasty, Pu-Yi, to restore him to his seat of Emperor of Manchuria. Japan's intention was to set up a puppet government so that Japan could rule all of China. The Chinese initiated a boycott of Japanese goods in response. But the Japanese retaliated by bombing a civilian neighborhood in Shanghai. The League of Nations condemned the Japanese occupation of Manchuria, but Japan simply withdrew from the League and continued its advance. Japan committed several more acts of aggression against China, then, in 1937, with an exchange of fire between Japanese forces and KMT forces across the Marco Polo Bridge outside Beijing, full-scale war broke out. By the early 1930s, however, the KMT had also been fighting on another front, clashing with CCP soldiers. From 1934 to 1935, Chiang, determined to crush the CCP once and for all, chased the CCP troops in what has become known as the Long March. Mao and his core followers traveled west, then north on a long, treacherous journey to escape the KMT. They finally regrouped in the north at Yan'an, in Shaanxi Province. When full-scale conflict broke out in 1937, however, the KMT and CCP agreed to join forces and fight the Japanese. Chiang's wife, who had been educated in the United States, made numerous appeals for American aid. Her charm won humanitarian aid for China, but it was not until Japan bombed Pearl Harbor in 1941 that the United States joined forces with the Allies to fight the Axis Powers. Almost as soon as the fighting against Japan was finished in 1945, the KMT and CCP renewed their struggle against each other. By the middle of 1949, it was clear that the Communists had the will of the people, and the KMT was in full retreat. The KMT re-established the Republic of China on the island of Taiwan, vowing to reconquer the mainland one day. Mao founded the People's Republic of China in October 1949.